In the aftermath of the French footballing tragedy Yoann Gourcuff is seen as both the culprit and the hero. In the build up to the tournament Raymond Domenech decided on a fluid attacking system, three attackers behind a solitary striker. Frank Ribery was going to provide the flair, Florent Malouda and Sidney Govou were going to provide the width, Nicolas Anelka was going to run into space and try to finish off the moves. Behind the solitary striker and three attackers Yoann Gourcuff was going to orchestrate it all. In the Costa Rica friendly before the World Cup finals the system worked wonderfully and it looked like France were going to stumble into the group stages of the tournament with confidence, a good shape, good form and a genuine chance of victory. A couple of disastrous friendlies later, including a defeat against China, and a dismal performance against Uruguay in their first match of the World Cup the French realised the system wasn’t working. Yoann Gourcuff was struggling. He was not dominating the play and didn’t seem to have the desire to impose his style on the match. He created nothing, he threatened little, France stuttered. The odd bad word was said about Ribery, Malouda, Govou and Anelka but the majority of the blame fell on Gourcuff. Anelka was excused because no chances were made for him. Ribery was excused because there was too much pressure on him. Malouda and Govou were excused because the ball never reached them in the correct positions. All the blame fell on Gourcuff. 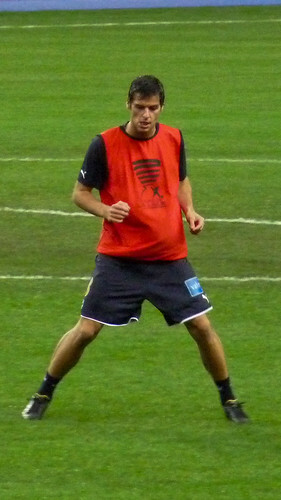 Yoann Gourcuff is the son of a prominent football manager, Gourcuff senior coaches Lorient in Ligue 1, and he is considered the heir French national side to Zinedine Zidane. Pressure is nothing new. Only Gourcuff appears to be indifferent to it all. French pundits have remarked that he is a genuinely splendid young man, with some, like Bixente Lizarazu, even proposing that he has been ‘raised too well and is probably too nice’. He is the picture perfect footballer, and a little more. Good looking, talented, a famous name, well mannered and a key figure in the national side at only 23 years old to boot. He inspired Bordeaux to the Ligue 1 title and then the Champions League quarter finals. Everything was set for Yoann Gourcuff to set the World Cup tournament alight. After one poor game against Uruguay, he was dropped. All of a sudden the French media started to speculate that Anelka and Ribery were deliberately ignoring Gourcuff on the pitch. Patrice Evra, the French captain, commented in an interview that nobody hears Gourcuff talk or socialises with him. Everybody was asking, how can Yoann Gourcuff be the leader of the team if some ignore him and nobody listens to him? The thing is Gourcuff was not the only player who performed badly against Uruguay. The entire team did. Raymond Domenech chose only to drop Gourcuff for the next match against Mexico. As you all know by know, France lost. Yoann Gourcuff was the culprit after the Uruguay match so he was dropped. Now that the whole world saw France play even worse against Mexico without him the French footballing public is looking to Gourcuff to be the hero again. In the space of a week Yoann Gourcuff has been the hero, the culprit and now is set to be the hero again. France needs a victory in the last match against South Africa, with Gourcuff as the lynchpin, in order to believe in the national team again.